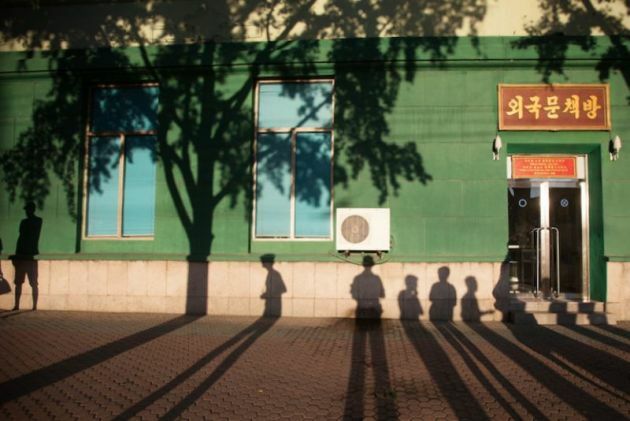 (Photo: © Sean Hawkey)Shadows on a Pyongyang street Aug. 8, 2016. Church representatives from countries including North and South Korea are urging the reopening of the North's Kaesong Industrial Complex as an important model for building peaceful cooperation and mutual trust. For the same reason the church leaders called also for the reopening for tourism of North Korea's 1,638-metre (5,374 foot)-high mountain Mt. Kumgang about 30 miles (50 kilometers) from South Korea. The call came after a Nov. 14-16 meeting in Hong Kong when 58 participants from churches and related organizations from North Korea and South Korea and 11 other countries met. Their aim was to promote improved inter-Korean relations and advancing the cause of peace on the Korean peninsula. The conference was organized by the World Council of Churches and hosted by the Hong Kong Christian Council. Launched in 2004, the Kaesong Industrial Complex is located inside North Korea just across the demilitarized zone from South Korea and was largely financed by the South to increase co-operation. South Korea suspended operations in February at the jointly-run industrial park in North Korea following a rocket launch and nuclear test by the North which triggered regional uncertainty and insecurity. It is seen as one of the last remaining points of peaceful engagement between North and South Korea, and is often seen as an indicator of relations between them, the BBC said in February. The church leaders said their meeting in Hong Kong was built on a long history of ecumenical engagement of Christians from both North and South Korea searching for peace and reunification after more than 70 years of division. The presence of delegations from both the Korean Christian Federation rom North Korea and the National Council of Churches in Korea from South Korea was pivotal to the conference and its outcomes, said the WCC in a statement. "We especially focused on the prospects and impact of a peace treaty for the Korean peninsula," the participants said after the meeting. They said, "It is the right time to begin a new process towards a comprehensive peace treaty that will replace the 1953 Armistice Agreement." "Ending the suspended state of war that has existed since the Armistice Agreement of 27 July 1953 is both long overdue and still critically and urgently necessary," said the statement. It noted that the absence of a formal end to the Korean War still colors and obstructs inter-Korean relations today, and encourages the escalating arms race and militarization of the peninsula and region. "We especially focused on the prospects and impact of a peace treaty for the Korean peninsula," participants said in their statement. They affirmed that, "it is the right time to begin a new process towards a comprehensive peace treaty that will replace the 1953 Armistice Agreement." No final peaceful settlement has been achieved yet. The signed armistice established the Korean Demilitarized Zone, creating a new border between the two nations. The Demilitarized Zone runs not far from the 38th parallel, which separated North and South Korea before the war. The churches statement said North Korea has repeatedly called for a peace treaty, but asserted that the United States has rejected such calls. They said, "Progress towards a peace treaty is needed now." This is needed, "in order to interrupt the spiraling cycle of mutual antagonism, confrontation and militarization, to reduce tensions and build trust, to ensure the withdrawal of all foreign troops from the Korean peninsula." It also need to "promote an environment in which current issues in inter-Korean relations can be addressed and, God willing, resolved." They noted, "In face of the many threats and challenges to peaceful co-existence on the Korean peninsula, we say a clear and emphatic 'NO!' to war and to the threat of pre-emptive attack. "We propose that future ecumenical initiatives with regard to the Korean peninsula be purposefully and explicitly configured so as to model and exercise leadership towards a process for a peace treaty to replace the Armistice Agreement." The group invited increased ecumenical support – through prayer, advocacy, solidarity and participation – for the ongoing NCCK Peace Treaty Campaign in 2017 (in Europe) and 2018 (in Asia). They said, "We cherish the longstanding ecumenical accompaniment of the relationship, dialogue and exchange between Christians from North and South Korea, as a rare and now possibly unique resource for peace in the region."